Silca is a pump maker in Milan, Italy. The Impero is one of three pumps that they have their gained great reputation on. The Impero is an extremely light weight, frame fit pump historically used for Road racing purposes only, but has now been discovered by an alarming number of mountain bike riders. It's made in 7 sizes, that range from 380mm up to 560mm in length. 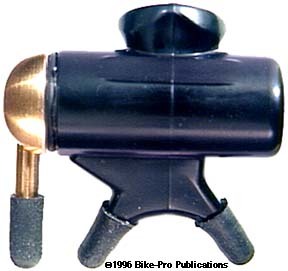 The seven sizes are needed to this single action pump fit snugly on the bike frame, when a pump head is installed. The Impero relies on a spring that surrounds the plunger shaft underneath the handle to be compressed slightly, so the pump body's expansive force holds it in place between the bottom bracket shell and the frame's top tube at the seat lug. The Impero is made largely from injection molded plastic and has no internal check valve, relying instead on the tubes valve stem to close and retain the air. The compression tube is the made of molded plastic, at the air chuck end there is a threaded plastic end cap glued in place. A pump "head" is later threaded onto this end cap. The plunger assembly uses aluminum tubing for the plunger shaft, and a cupped piece of greased leather for the piston assembly. The plunger assembly is held in the pump compression tube by a White molded nylon cap which threads into the compression tube. The pump handle is molded of plastic matching the compression tube in place around the expansive spring, on the plunger shaft. 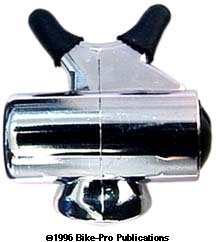 An aluminum sleeve slides over the compression tube at the air chuck end. This sleeve functions as the second hand grip surface for using the Impero. A rubber flat washer threads onto the air chuck compression tube end cap to hold the sleeve in place until pump "head" or what we refer to as the air chuck's installation. The rubber flat washer creates a seal between the compression tube and the installed air chuck. Although the Impero is made in seven colors we sell it in four Blue, Black, White or Chrome plated. The Chrome plated model costs us more, therefore it costs you more. You will need to buy the pump "head" or air chuck separately, and they are available through us to fit a Presta valve only. Your choices will be the Silca head which are listed below. An exact measurement of the distance from the center of the bottom bracket shell where the seat and down tube join, to the center of the top tube on your frame in millimeters, will be required to insure a tight fit of the Silca Impero pump. Because the fit of this pump is so critical, we have included a separate table which includes two size tables as well as the weight of the body, for each of the pump body lengths. Remember the price is for the pump "body" only, you will need a pump "head" also. The Impero is a simple and serviceable frame pump, notice how light they are, and you will understand why so many ardent riders have used them for so long.